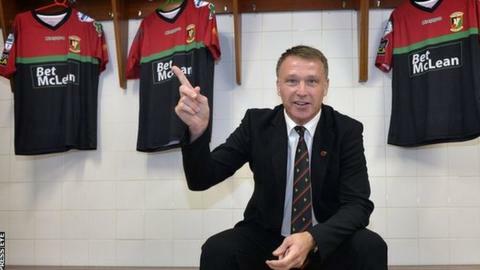 Glentoran have appointed former Republic of Ireland defender Alan Kernaghan as their new manager on a two-year deal. The 48-year-old, who has managed Clyde and Dundee, takes over after Eddie Patterson was sacked last month. The Glens are unbeaten in six games under caretaker boss Roy Coyle and sit sixth in the Irish Premiership. "I'm excited about the challenge of getting the club back up the league and challenging," said Kernaghan. Kernaghan played for Middlesborough and Manchester City while he had a spell as Brentford caretaker manager in 2013. "I want to give the players a bit more freedom and the team being more attractive in how we play," he added. "Next season I would be hoping for a top two finish at least." Kernaghan has landed the Oval job after several candidates opted out of the race. H&W Welders boss Gary Smyth, former Newry City manager Pat McGibbon and new Derry City boss Kenny Shiels were all linked with the position before asking not to be considered. Kernaghan was born in Yorkshire but moved to live in Bangor, County Down, with his family at the age of four and went on to represent Northern Ireland at schoolboy level. However, he was called up by then Republic of Ireland manager Jack Charlton in 1992 and went on to win 22 caps for his adopted country. Kernaghan's international appearances included the World Cup qualifier against Northern Ireland at a hostile Windsor Park in November 1993 when a 1-1 draw secured the Republic's qualification for the 1994 World Cup finals in the USA.